A quick summer meal! 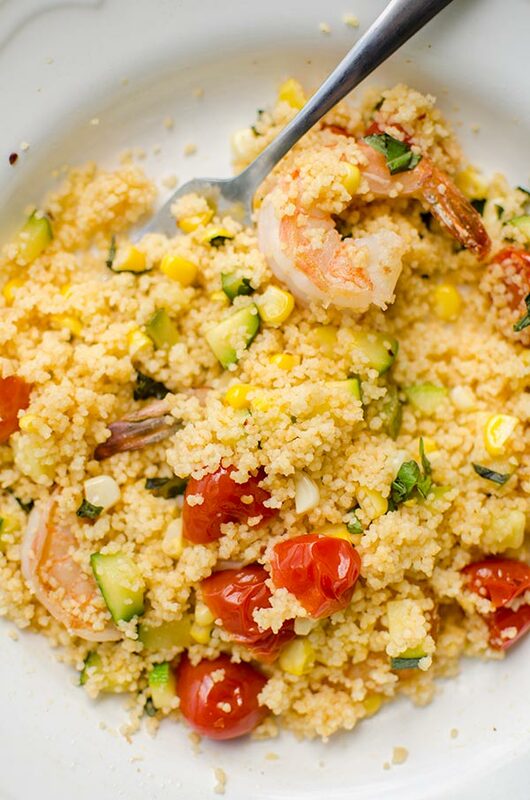 This recipe for one-pot couscous with shrimp, zucchini and corn is fresh and flavourful with cherry tomatoes and fresh basil. One pot dishes are all the rage on the internet, but I’ve found that a lot of them aren’t really the best quality. (Honestly, call me crazy but I don’t want to have boiled meat in my one pot pasta). I started working on this recipe way back at the beginning of May and it was the first summer recipe I created and I think it might be my favourite. I’ve been waiting until August to post this recipe because corn, zucchini, tomatoes and basil are all in season (finally!). I have hit a serious, serious case of writer’s block. I think this might the worst block I’ve had in a couple of years (or maybe ever?). I spent a long time trying to figure out what I was going to write about in this post, but honestly, I think I need to write about this block to actually work through it. Sometimes it’s hard to pinpoint why you’re having a creative block, but after spending a ton of time creating, I know myself well enough to know what’s going on. Stress = writer’s block. Exhaustion = writer’s block. If I look back on old posts, I always had writer’s block during exams, when I was A) exhausted and B) stressed out. Which is basically what I have been feeling like all summer. If I look back on May-August, there has been a lot of change and a lot of extra stress in pretty much all areas of my life. By the time Friday hits, I feel like I’m running on empty. When you run a blog (on top of working long hours) there really isn’t a ton of time to take breaks, but you have to take them for your own sanity. I’ve learned what I need to do in order to feel balanced and centred when things rev up a notch (or seven). But I have totally failed in taking my own advice because I’ve been burning the candle on both ends for far too long (ahem, for 4-months straight). It can be so hard to carve out the time, but I know that I feel more rested and have more clarity in pretty much everything. Sometimes I just want to know what it feels like not to be tired all the time, you know? I realize that 90% of the population probably feels the same way and I’m not alone in this by any means. But when you don’t even have time to grocery shop for three weeks you know it’s hit a bit of an extreme. The best thing about this one-pot couscous recipe is that it is so incredibly fast to make because each ingredient individually takes minutes to cook. 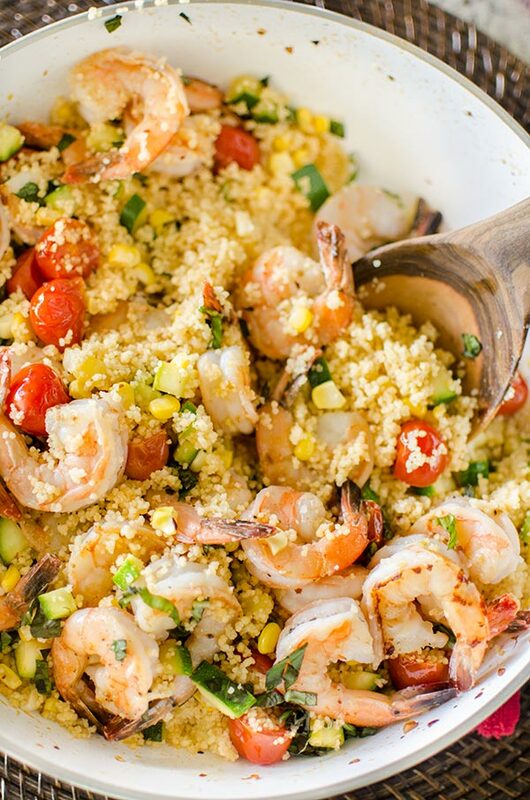 Shrimp cook up in just a couple of minutes, couscous literally takes five minutes to cook and then finely chopped zucchini, cherry tomatoes and corn are all basically done before you have a chance to blink. I’m telling you, this recipe has been a staple for me throughout this fast-paced summer. My plan for this weekend involves a lot of resting and relaxing. I think it’s time to recharge before the fall, don’t you? Heat a large skillet over medium-high heat. Add olive oil and cook shrimp for 1-2 minutes per side until opaque and light pink. Remove to a plate and set aside. Reduce heat to medium-low, add tomatoes, garlic and red pepper flakes. Cook for 5 minutes, or until tomatoes start to break down and garlic is fragrant. Add zucchini and 1/4 tsp of salt, cook for 3-5 minutes. Add corn, continue cooking another minute. Reduce heat to low, pour in water, couscous and remaining salt. Cover and steam couscous for 3-5 minutes. Remove from heat, stir in basil, lemon and reserved shrimp. 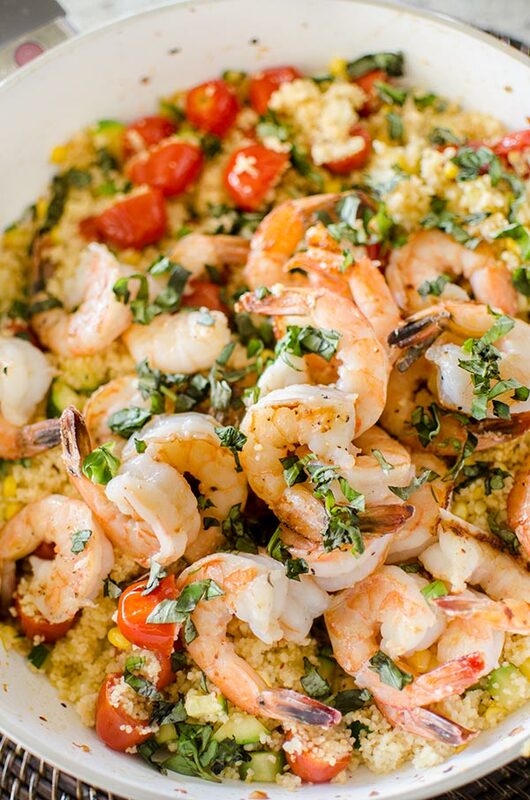 Let me know if you give this one-pot couscous with shrimp a try in the comments below.